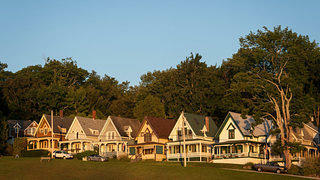 Bayside, Maine, was a religious camp meeting site during the summers in the mid-19th century. Each year on the third Wednesday in August, the community of Oak Bluffs in Martha’s Vineyard, Massachusetts, participates in a hallowed ceremony that has been performed generations over. Called the Grand Illumination, narrow, colorful cottages lining the shady streets of this close-knit island become even more noticeable and bright as people decorate Chinese and Japanese lanterns before stringing them along the porches. People meet at the pavilion, or tabernacle, sing songs and play music, before the oldest person in the community lights the first lantern. The heightened sense of community expressed in the Grand Illumination is based on the original foundation of camp meetings that began in the 18th century to strengthen the Christian faith of Americans along the frontier following the American Revolution. 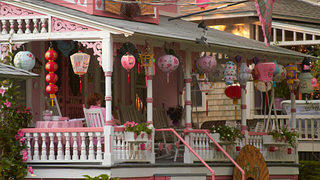 A cottage at Oak Bluff decorated for the Grand Illumination. 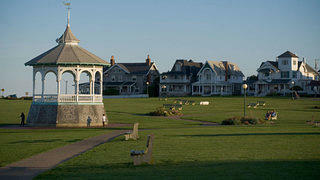 The public green space at Oak Bluffs naturally fosters community. 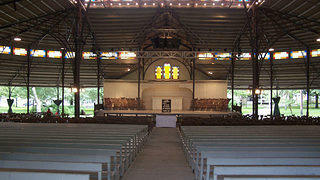 The tabernacle at Oak Bluffs. For Sara Hines, an architect and urbanist in Massachusetts, it was this palpable sense of community found at camp meeting sites that appealed to her. “There are about 1,000 camp meeting sites still in existence today,” says Hines. “So far, I’ve visited 60.” It’s an impressive number, considering they are spread out throughout the country, from Maine to California and everywhere in between. Bill Fitzpatrick explores relics of the Second Great Awakening that hold important lessons for today. In many ways, that is the allure of camp meetings, which still attract attendees each year. So many of these sites are hidden away—not intentionally, but simply because over the years, its members inherited the houses and camp meeting traditions, and their histories and location were simply known. In this way, they have remained true to their original purpose—to foster the community culture strengthened by meetings each year. Unfortunately, though, what makes these camp meetings so unique are what sometimes leads to their neglect. Because many of these cottages are inherited, occasionally people who cannot afford the upkeep of the historic cottages or who no longer attend camp meetings become the new generation that the survival of camp meetings depend on. It makes the preservation of them difficult. 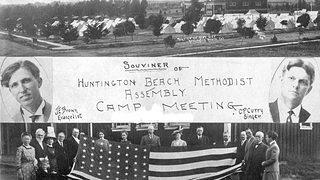 Camp meetings extended across the United States, from Maine to California. 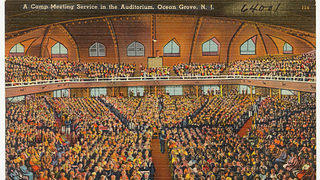 At Ocean Grove, New Jersey, almost 100 tents would be constructed each year for meetings. But Hines is doing her part to preserve these communities. At each of the 60 sites she has visited, Hines takes detailed notes and photos. She focuses on documenting each site's geography, architecture, and spatial layout. She compares the sites to early recommendations. A camp meeting manual from 1854, for example, recommended for a layout that included a central seating area with tents surrounding it. Hines has observed that this is still the most prevalent design across regions. Many were established in the woods, far away from towns. The idea was that the further people had to travel, the more invested they would be in their religious experience. By the late 19th century, camp meetings cropped up close to the railroad lines for easier access. The construction of the cottages at these meeting sites also attracted Hines’ attention. 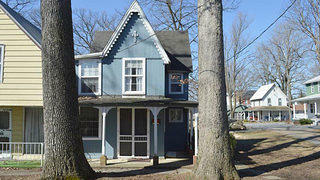 The Victorian cottages in New England, for example, were typically constructed with tongue-and-groove vertical boards. 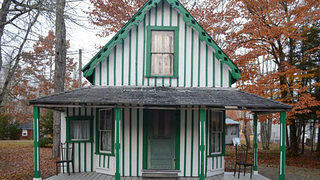 The pine boards used for these cottages contained a hearty amount of sap that hardened over time. The walls, which were usually no more than one inch thick, became naturally very strong and durable. And while most sites share spatial similarities, Hines has observed regional differences. There is one near the Canada border, for example, where the cottages are arranged in concentric circles and are painted in matching stripes. Ackerman, Mississippi, has a camp meeting site where the cabins were built in the vernacular dogtrot style. Hines is fascinated by the way the camp meetings seem to track American history. "In New Jersey, a camp meeting was established three weeks after Gettysburg," she says. "Most people were in mourning, so meetings established following the Civil War were more restrained. Everyone had lost someone." Hines plans on visiting as many as she can, including sites further away from where she lives in Massachusetts. While Hines isn't sure where her next round of research will lead, she hopes that she can bring greater attention to these uniquely American sites. "It would be nice to have a database to exchange information—so many don't know about other camps," she says. "I do my best to chronicle them, but it's such a vast project."